may be sharing its last stories with us, but I have a feeling that the lessons it's taught us will be around for years to come. Now if only I could practice the best of them, with a British accent. As the final season of the popular BBC drama, Downton Abbey, hits American airwaves, I think many of us on this side of the pond feel a tad sentimental. After all, I've spent the last five years experiencing the ups and the downs of both Downton's elite and its most humble. I've both loved -- and, yes, dare I say it, even despised -- some of its characters. For me, the storylines that have stood out the most over the years are those of love and marriage. Matthew and Mary. Mr. Bates and Anna. Sybil and Tom. Mrs. Hughes and Mr. Carson. So with that in mind, I give you five lessons Downton teaches us about marriage. Let's face it, everything sounds better in a British accent. The Late Show with Stephen Colbert recently proved it. This leads me to believe that arguing in such an accent could mean one of two things for American marriages. One, we'll at least sound a bit more refined in the heat of the moment, that is if we go with a Received Pronunciation accent, rather than Cockney. Think upstairs Downton, versus downstairs. And two, it's possible that many arguments will end in laughter. After all, who can stay serious and angry when using words like "kerfuffle" and "tosh." Here's the bad news. At least, for me. I can't even fake a British accent. Just ask my undergrad theater professor about the Shakespeare scenes I attempted way back when. That said, I can do a fairly good Scarlet O'Hara impression. But I have a feeling if I go Southern Belle during an argument, my husband Ted may just turn to me, hopefully with a wink in his eye, and say, "Frankly, my dear, I don't give a damn." Here's hoping your Lady Mary accent is better than mine. 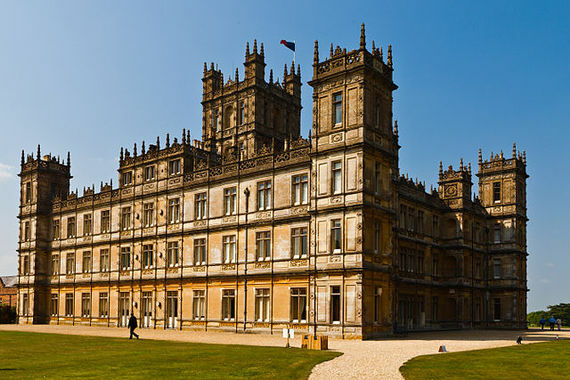 Should I list the number of Downton Abbey characters who have attempted to keep some sort of secret from someone, only to be found out eventually? Mary. Edith. Anna. Lord Grantham. Even the Dowager Countess is included in the list of secret keepers. Her romance with a Russian Prince comes out several decades after the fact. While secrets in any relationship aren't ideal, secrets are especially damaging when they're between spouses. So if a secret doesn't have to do with a birthday, anniversary, or Christmas gift, don't keep it from your partner. As seventeenth-century French dramatist Jean Racine once wrote, "There are no secrets that time does not reveal." Rather, stick with honesty and forthrightness. It's these things that build trust, not secrecy. "You've lived your life, and I've lived mine," Matthew tells Mary in season 2. "Now it's time we live them together." While it may have taken Matthew and Mary eight Downton years (through which, neither seemed to have aged more than one television season) and two proposals to finally say "I do," these two made a great team. You know, until Matthew was killed off in a car accident so actor Dan Stevens could pursue other things. Yes, I'm still a little bitter about that. "You can always hold my hand if you need to feel steady," Mrs. Hughes tells Mr. Carson. "I think I will hold your hand. It'll make me feel a bit steadier," he replies. I don't know about you, but I teared up when Mr. Carson proposed to Mrs. Hughes. To me, they make a perfect -- and long-hoped for -- match. They also remind us of an important truth about love. And that's this: Love isn't always intense and passionate. Sure, it is at times, and when it is, that's wonderful. Every marriage needs romance and passion. But there are times when long-term love is simply comfortable -- and that's okay. Prime minister Winston Churchill once said, "...never give in, never give in, never, never, never, never -- in nothing, great or small, large or petty." While he uttered these words in 1941, after fictional Downton servants Mr. Bates and Anna would have heard them historically, this idea of "never give up" is a defining characteristic of their relationship. Remember early in the show, when Bates is accused of murder? Anna stands unwaveringly by his side, fighting to prove his innocence. At one point, Bates asks her, "Do you never doubt? For just one minute? I wouldn't blame you." Her reply? "No. And, before you ask, I don't doubt that the sun will rise in the east, either." Later, after Anna is raped and attempts to keep it a secret from Bates, he never gives up until the unsettledness in their relationship is made right. And, of all the lessons Downton teaches us about marriage, this is the one we should practice the most. Don't be quick to give up on your spouse -- not in the "great or small, the large or petty." Instead, when it comes to your partner, be a Mr. Bates or an Anna. Downton Abbey may be sharing its last stories with us, but I have a feeling that the lessons it's taught us will be around for years to come. Now if only I could practice the best of them, with a British accent.